July 4th, 2017. 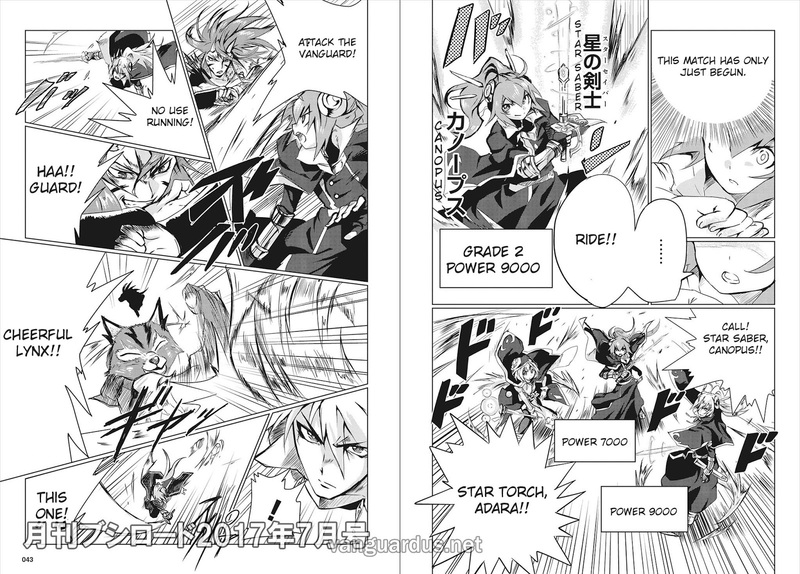 Monthly Bushiroad magazine's official Twitter account teased a page from the next chapter of Cardfight!! Vanguard: Shooting Star, an ongoing manga circulated in the magazine. Shooting Star's climax centers on the stride form of protagonist Matsumoto Asuka's key card, Millionaire. The Millionaire stride gains +1,000,000 power when she attacks, and prevents the opponent from calling perfect defense cards to the guardian circle, but in exchange reverts her own critical to 0. 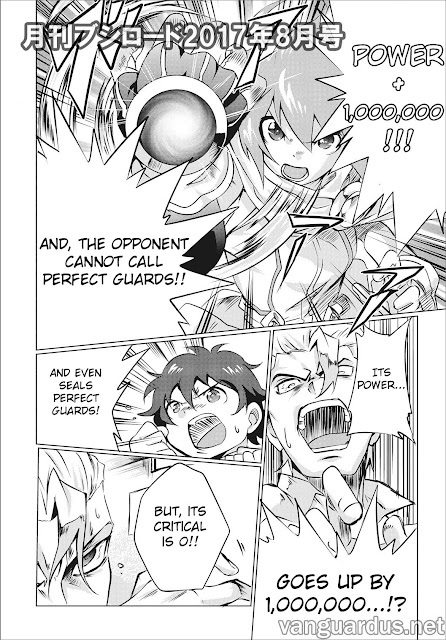 While functionally impossible to guard--300k accounts for the entirety of the shield contained in the average main deck, and only a handful of skills superior call perfect guards--an attack of this type would be entirely reliant on checking critical triggers just to deal normal damage. 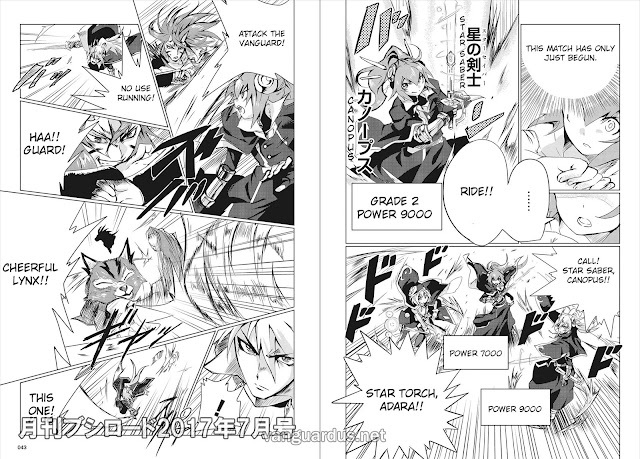 "The VG Manga Award winner "Vanguard SS (Shooting Star) reaches its long-awaited completion!! 'Power +1,000,000'!!? But 'The critical is 0'??! An original unit's original skill explodes onto the scene!!! Don't miss the exciting conclusion!!" While manga-original cards have been gradually introduced to the actual card game many times over the years, their skills are frequently adjusted to have appropriate costs attached. For example, "The Dark Dictator" in the manga gave +5000 power to all front-row Shadow Paladin rearguards continuously, while in the actual game this skill could only be used on-ride and cost soulblast 3. As a whole Asuka's deck revolves around "star" units; in previous chapters she rode the 9000-power grade 2 "Star Saber, Canopus," and called the 7000-power grade 1 "Star Torch, Adhara," while her grade 3 was "Super-Star, Millionaire." Canopus and Adhara are respectively named after the real-world stars Alpha Carinae and Epsilon Caenis Major. Each of these cards follow a particular naming convention of Japanese Vanguard, where the literal meaning of their written names is supplanted by a forced pronunciation. Millionaire's name is written "Number-One Star Heroine, Millionaire" (一番星の英雄ミリオネア Ichiban-sei no Eiyuu Mirionea) but is spoken aloud as "Super Star, Millionaire." (スーパースター ミリオネア Suupaa Sutaa Mirionea) Asuka's clan has been the subject of much speculation up to now, but hasn't been addressed directly. The Shooting Star manga follows Vanguard's first female protagonist, Matsumoto Asuka, a high schooler managing her missing father's titular card shop, "Shooting Star." After her assistant Togakushi Shuuya turns out to be one of the "Twelve Tyrants" of the card gang Crown, Asuka is drawn into a battle with him over the secret of her disappeared father's strength. Written and illustrated by Mitsukoshi Haruha, the manga was selected to receive the Vanguard Manga Award in commemoration of Monthly Bushiroad's third year of circulation, and is being serialized for three chapters alongside the Cardfight!! Vanguard, G, and MiniVan manga. 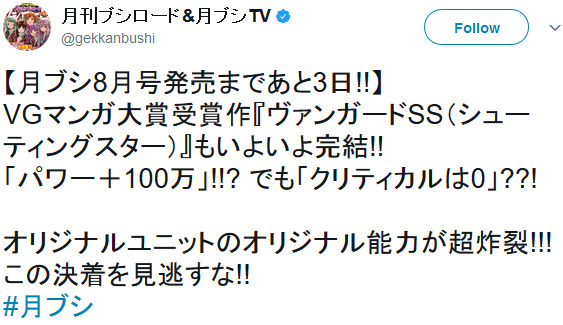 The August issue of Monthly Bushiroad will mark the end of the series' planned run, though with eleven more Tyrants remaining, there's ample room for Shooting Star to be expanded on in additional installments.